It’s a safe bet that you’ve visited one or more of the Walt Disney Company’s theme parks and are an experienced guest. It’s also likely that you’ve interacted with many Disney Cast Members, who are universally adorned with distinctive Disney Cast Member name tags. You may even have dreamed of working in a Disney park one day. For a select group of college students that dream becomes a reality, courtesy of the Disney College Program which provides students a unique opportunity to learn valuable skills in customer service and professionalism. 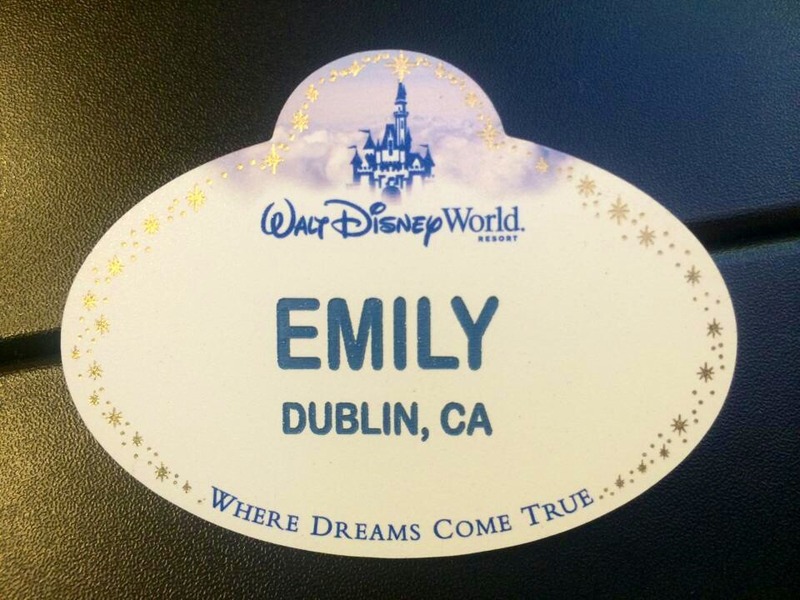 Dublin High School graduate and University of Arizona rising senior Emily Edlund is currently completing the Disney College Program in Walt Disney World, Florida. She graciously agreed to sit down with OneDublin.org during her day off and share her experiences since joining the program earlier this year. OneDublin.org: It’s been a couple of years since you wrote your Life in College article about the University of Arizona; before talking about the Disney College Program, how are things going at school? 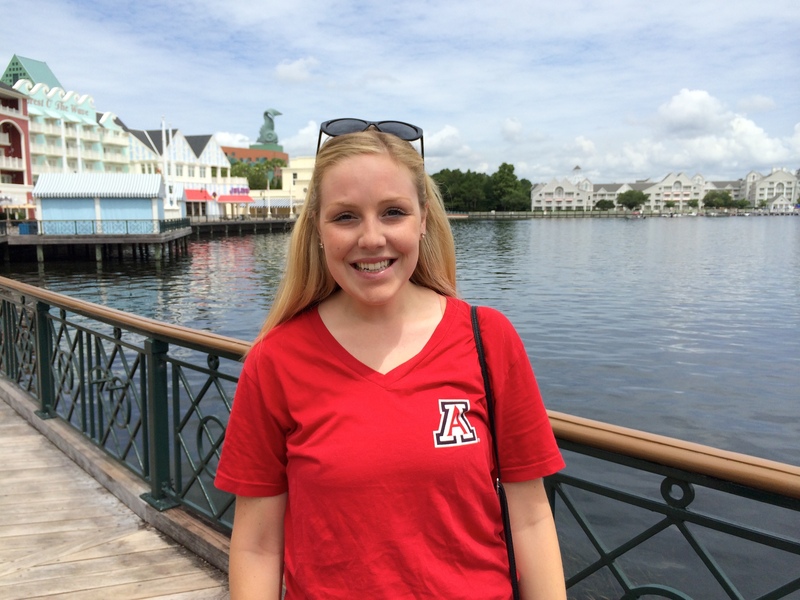 Emily Edlund: “The University of Arizona has been great. I’m currently completing a political science major with a pre-law minor. OneDublin.org: How did you find out about the Disney College Program? OneDublin.org: Describe the process of applying for and being accepted into the program. Edlund: “I reviewed the information available on Disney’s website and signed up to receive an email when the application window opened for the spring semester. As soon as I was notified I immediately started applying. The first step in the process was completing an online application including your resume, a preference for Disneyland, Walt Disney World or both, and the type of program; I chose the longer Spring Extended Program at Disney World. Even though it’s hard sometimes being so far away from home, I’m an adventurous person and after taking six classes per semester I needed a break from school. “I made it through the resume screen and was next asked to complete an online interview, which included a series of timed questions that asked how you’d respond in a variety of situations. I made it through the online interview and was scheduled for a phone interview, and had a week to prepare. I also had to provide preferences on the types of roles I would be interested in such as character attendent, housekeeping, food service, attractions, auditioning to be a character and so on. My top three were attractions, character attendent and park greeter. “I had no idea what to expect so I went online and researched the process and possible questions. I also found some useful advice on how to prepare the morning of the interview, such as listening to Disney music to get in the spirit and sitting in front of a mirror during the interview to make sure you are smiling. I spoke to the friend who originally recommended the program and she told me the interviewers sound like they ate a bowl of pixie dust so you have to sound as happy and enthusiastic as you can possibly be! OneDublin.org: How did the training process work after you were hired? Edlund: “After moving into an apartment with other Disney College Program students, and completing background and drug tests, my first official day of work started with the Traditions class. We were required to dress business professional and in the class we learned about the history and heritage of Walt Disney and the parks, how Walt started a small business and built the global company we know today. We toured the Magic Kingdom as a group, learning more about how the parks were created. “When we returned to the classroom there were a few special surprises that I’ll keep secret, including how we received our name tags. I’ll always remember the feeling of receiving my name tag as a cast member in Walt Disney World! OneDublin.org: What different jobs have you had since you started the program in January? OneDublin.org: What have you learned about Disney as a cast member that guests may not be aware of? Edlund: “From the beginning I’ve been taught that safety is the first priority. We have four keys that we follow and the first one is safety. The second is courtesy, followed by show and efficiency. We are trained to always put safety first regardless of the situation. “People are in such a hurry to get from one place to another that you’ll sometimes have guests get mad at you. As a cast member and you have to understand that guests can be stressed out, trying to jam in everything because you can spend weeks at Disney World and still not have done everything. We’ll do things like standing at corners during a parade, directing guests to walk in lanes, almost like a traffic cop, to help prevent collisions. “I’ve learned that with customer service you have to get used to taking the blame for things, and that it’s our job to take the stress off guests shoulders, and do what we can to make guests happy. “Working here has made me more of a Disney fan because I’ve seen how Disney treats its guests. I’m proud to work for a company that treats its guests like family. I dealt with a family last week, near the Mexico pavilion in the World Showcase. The entire family was crying so I approached an older couple, who were standing off to the side, and asked if there was anything wrong, if I could help. They told me the mother had just learned that her brother had passed. OneDublin.org: Any other advice for students considering the Disney College Program? Edlund: “Some people try to do school and the Disney College Program at the same time and in my experience it’s very very hard, it was harder than taking six classes in a semester. I tried doing it earlier in the year, and I realized it wasn’t realistic. Right now I’m taking one class, but I’m also taking an extra day off each week to study. “When I was a freshman I started taking an extra class per semester and I’m really glad I did because it made it possible to change my major, take a full semester off for the Disney College Program, and still be on track to graduate with my friends, on-time, in four years. You don’t enter college expecting to change your major, but it’s important to follow your passion. And if you can’t handle six classes per semester, there are summer sessions or options at community colleges. OneDublin.org: One final question: what are your top three Walt Disney World attractions now that you’ve spent several months here? 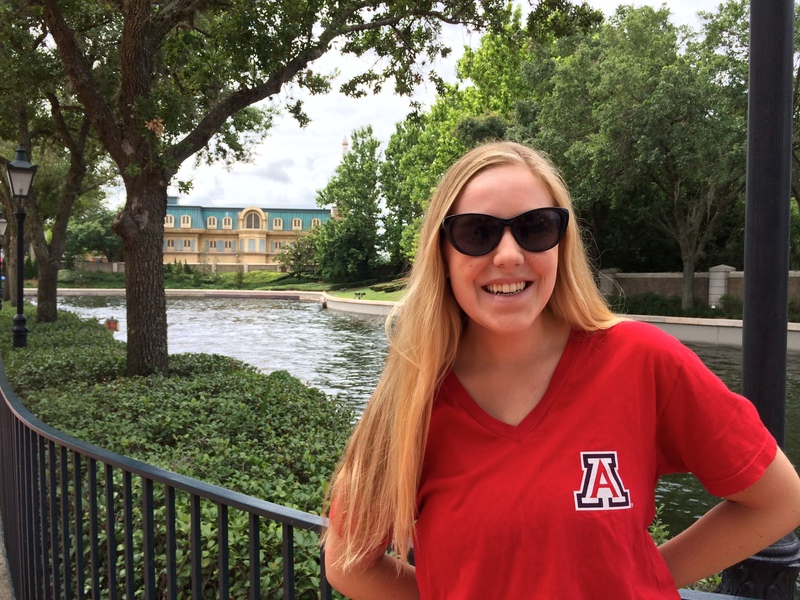 Ms. Edlund is currently completing a political science major, minoring in pre-law, at the University of Arizona and authored a Life in College Series article about her freshman year.